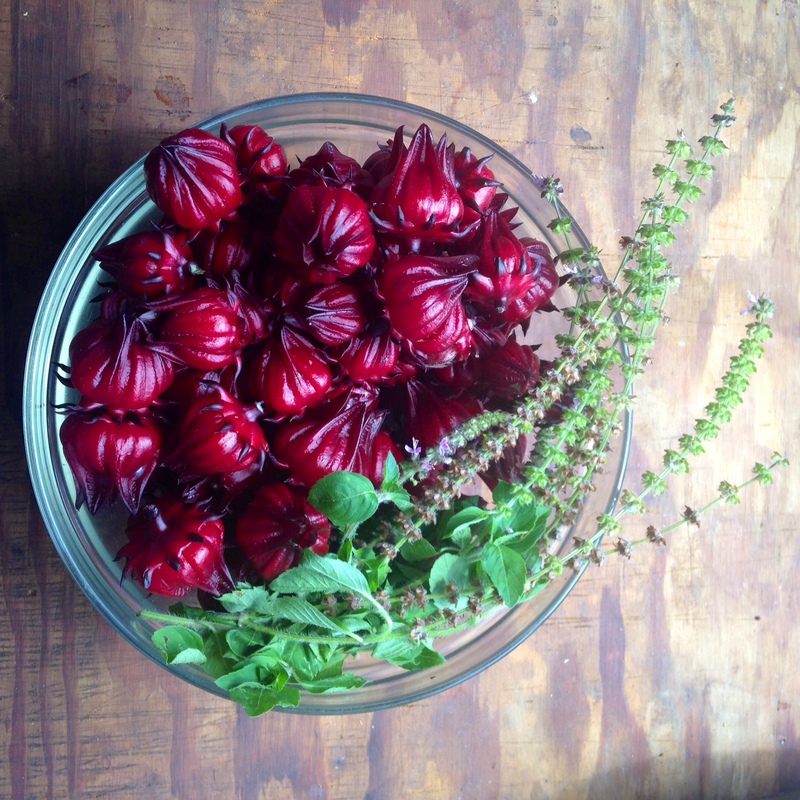 Thanksgiving From the Garden! 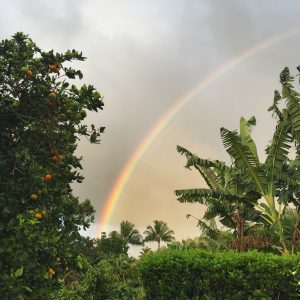 - Kauai Seascapes Nursery, Inc.
You are here: Home › Blog › Thanksgiving From the Garden! Well, we’ve had a lovely fall season so far after what felt like a year of nonstop rain! It’s officially November and right around the corner is the foodie’s favorite holiday, Thanksgiving! I know that what I am most thankful for is the opportunity to live on this amazing island and enjoy all the delicious local fruit and produce. 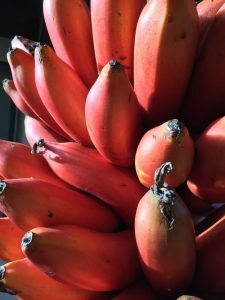 We are so very lucky to be blessed with a year-round growing season and such a wide seasonal variety of tropical fruits. Some of my fall favorites are breadfruit, or ulu in Hawaiian, bananas, and citrus! 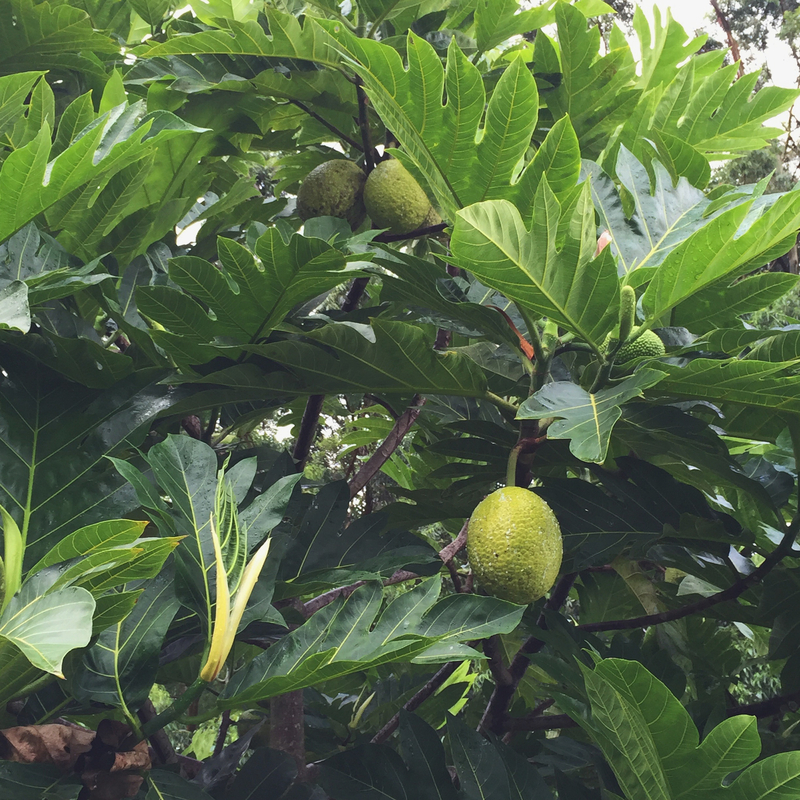 If you don’t have breadfruit, banana or citrus growing in your yard yet you should think about planting some! 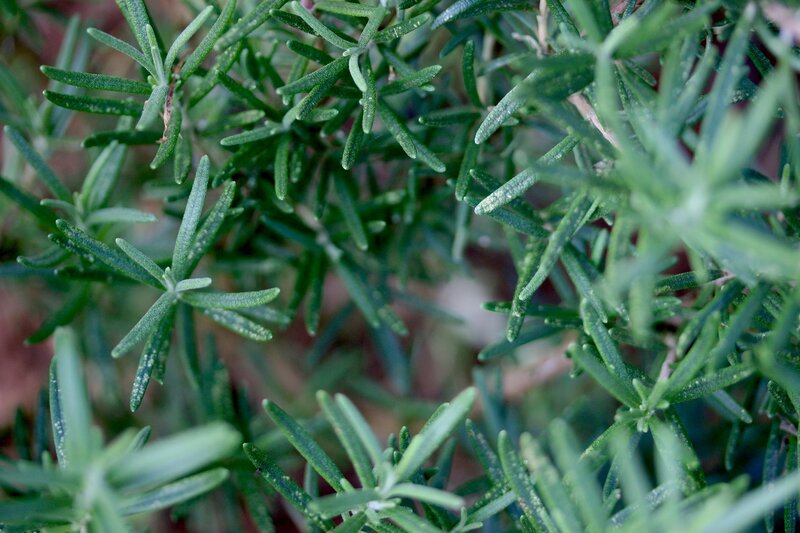 We carry these easy to grow trees all year long. 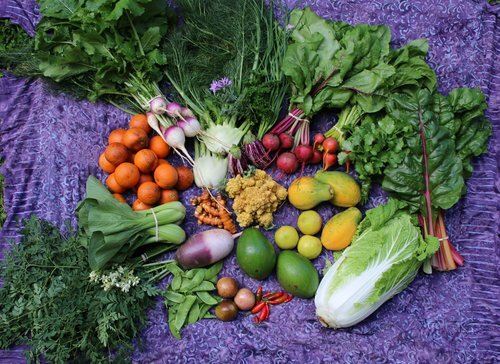 If your yard isn’t big enough or you don’t want to wait for fruit you can also sign up for a CSA subscription from a local farmer like Zoli and Ka ‘Ohi Nani Gardens and get a weekly box of fruits and veggies delivered to your door! A CSA subscription, short for Community Supported Agriculture, is a great way to enjoy the seasonal variety of fruits and vegetables. You’ll save time by not having to go grocery shopping and save money by buying directly from the farmer. It also supports the local economy and community which we can all be thankful for! Here are some of our favorite local style Thanksgiving recipes so you can enjoy the abundance of the island this holiday season! Put the chopped, boiled ulu in a bowl, add all other ingredients and mix with a potato masher, large wooden spoon or an electric mixer. Voila! Rosemary is essential at Thanksgiving! Mix all ingredients & stuff into turkey cavity before cooking! 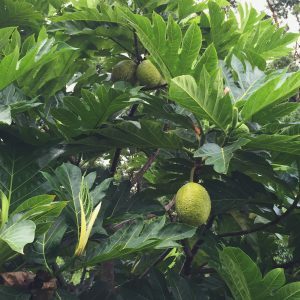 A note about Ulu: A lot of people are intimidated by breadfruit! They don’t know how to cook it, they think it will be hard to peel or its too sticky. But all of these are misconceptions! You can cook breadfruit literally ANY WAY. You can peel it and boil it, fry it or bake it. You can leave the skin on and put it whole in the oven or even the fire! You can eat it hard like a vegetable or ripe like a fruit. 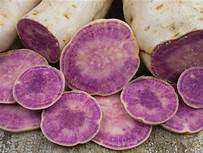 When it comes to how to cook it, I like to think of it as either like a potato when it’s unripe or banana when it’s ripe. It’s faster and easier to peel one breadfruit then the equivalent 3-5 potatoes and if it’s a bit sticky and sappy you just put a little cooking oil on your knife. Peel the sweet potatoes and cut them into slices. Melt the butter in a heavy skillet and add the sliced sweet potatoes. Mix the sugar, cinnamon, nutmeg, and salt. Cover the sweet potatoes with sugar mixture and stir. Cover skillet, reduce heat to low and cook for about 1 hour or until potatoes are “candied”. They should be tender but a little hard around the edges. Also, the sauce will turn dark. You will need to stir occasionally during the cooking. Stir in the vanilla just before serving. Serve hot. Heat the water, juices, cinnamon, and sugars to boiling in a 3-quart saucepan over medium heat, stirring frequently. When the mixture begins to boil, lower the heat and boil 5 minutes longer, stirring constantly. 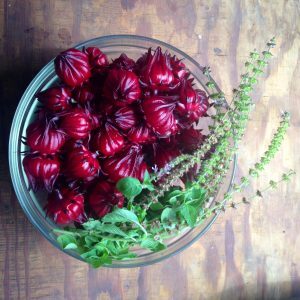 Add the chopped roselle, return the mixture to a boil, and continue cooking 5 minutes longer, stirring constantly to avoid scorching. You’re done! Enjoy warm or refrigerate for a few hours before serving. Serves 12 – 20. The tangerine & banana trees at Ka ‘Ohi Nani Gardens are the pot of gold at the end of the rainbow! *This recipe requires one 9-inch single Flaky Piecrust, rolled out and fitted into a pie plate, edges trimmed and crimped. 1/2 cup fresh tangerine juice (4 to 6 tangerines) – You can also use tangelo, orange or even lilikoi! Preheat oven to 425°. Prepare pie crust and refrigerate 30 minutes. Line crust with wax or parchment paper; fill with dried beans or pie weights. Bake until edges turn light brown, 8 to 10 minutes. Remove crust from oven; remove paper and pie weights. Reduce oven temperature to 350°, return crust to oven and bake until crust turns golden brown, about another 5 minutes. Remove to a wire rack; let cool. To make filling: In a large saucepan, combine sugar, cornstarch, and salt. Gradually whisk in tangerine juice until smooth. Whisk in egg yolks until thoroughly combined. Stir in tangerine rind and butter. Over medium heat, cook mixture, whisking constantly, gradually reducing the heat as filling begins to bubble and thicken, 8 to 10 minutes. Remove from heat; pour hot filling into pie crust. Set aside. Spread powdered sugar evenly in large nonstick skillet. Cook over medium-high heat without stirring until the sugar begins to melt and caramelize on the bottom (sugar layer will slide when skillet is tilted), then stir until all sugar is melted and deep amber and caramel is smooth, 3 to 4 minutes. Add 1 cup cream, rum, and 1/4 teaspoon salt (some clumps will form). Stir until caramel is thick and smooth, about 1 minute. Mix in remaining 1/4 cup cream. Remove from heat and add butter; stir until sauce is thick and smooth, about 1 minute. Strain sauce into small bowl. 7 cups 3/4-inch cubes crustless brioche or egg bread (from 1-pound loaf) – You can also use boiled ripe breadfruit! Preheat oven to 350°F. Spread bread cubes out on a rimmed baking sheet. Toast until beginning to feel dry but not hard, about 7 minutes. Cool on sheet. Whisk eggs, 3/4 cup sugar, and 1/8 teaspoon salt in large bowl to blend. Bring cream and half and half to simmer in medium saucepan. Very gradually whisk cream mixture into egg mixture. Strain custard into medium bowl; mix in vanilla. Cool to lukewarm, about 30 minutes. Whisk brown sugar and butter in large skillet over medium-high heat until smooth sauce forms, about 1 minute. Whisk in rum, lemon juice, and 1/4 teaspoon salt. Add bananas and toss just until coated, about 30 seconds. Remove from heat. Lightly butter 8x8x2-inch glass baking dish (8-cup capacity). Scatter 1/3 of bread in dish. Top with half of bananas and half of syrup from skillet. Scatter half of remaining bread over. Top with remaining bananas and syrup from skillet, then remaining bread. Pour custard over. Let pudding stand 30 minutes, occasionally pressing down bread to submerge and to absorb the custard. Preheat oven to 350°F. Place dish with pudding in a 13x9x2-inch metal baking pan. Add enough warm water to pan to reach halfway up sides of pudding dish. Cover baking pan with foil. Bake pudding 30 minutes. Uncover and bake until puffed and set in center, about 45 minutes longer. Remove from water bath and let stand 15 minutes. Serve warm or at room temperature with warm caramel sauce. Wishing you a thankful and abundant holiday season from all of us at Kaua’i Seascapes Nursery! 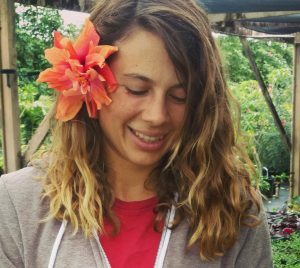 This article was written by Zoli, Senior Sales Associate and Landscape Designer at Seascapes Nursery.